Once upon a time, (2005, as I recall,) a nice lady named Mrs. Frazier awoke to an unaccustomed sound emanating from the lower level of her modest home in Staten Island. It began as a “gurgling,” evolved into a “babbling,” and quickly grew into a series of growls and barks, interspersed with the sounds a giant might make if he were trying to clear his throat of all the phlegm in the world. Alarmed, Mrs. Frazier stood at the top of her stairs and peered cautiously down, wondering why some escaped demon from hell had chosen her home to chew his way into. Happily, Mrs. Frazier was spared an eye-witness account of what happened next – a silent but deadly eruption somewhere in her communities aging sewer system, powerful enough to send a few hundred gallons of raw sewage flying backwards through the vast network of subterranean pipes, out of her now ignominious commode, and into her once tasteful clubroom. The effluvium entered her home with extreme prejudice, and within seconds, everything was covered. Dozens of family photos, treasured keepsakes, and other cherished possessions were instantly buried under a thick layer of human waste, courtesy of Staten Island’s crumbling infrastructure, and Mrs. Frazier’s many fiber-conscious neighbors. The resulting carnage defies description, but the attached photo was precisely what I saw two days after the event. This is Mrs. Frasier’s Exploding Toilet, and I think of it every April 25th, which as you surely know, is National Hug a Plumber Day. Though the dirty job in question was that of a Disaster Cleanup Specialist, I’ll always associate this particular image with the important work of America’s plumbers. Because really, Mrs. Frazier’s Exploding Toilet is a cautionary tale, and a sobering reminder of what our country would soon resemble if all the plumbers called in sick for the next few weeks. America need more plumbers, and the ones we have would no doubt appreciate some more hugs. So if your able, express your gratitude up close and personal. In fact, if I might be so bold, why not extend the sentiment throughout the following week? I’m sure the organizers wouldn’t mind. 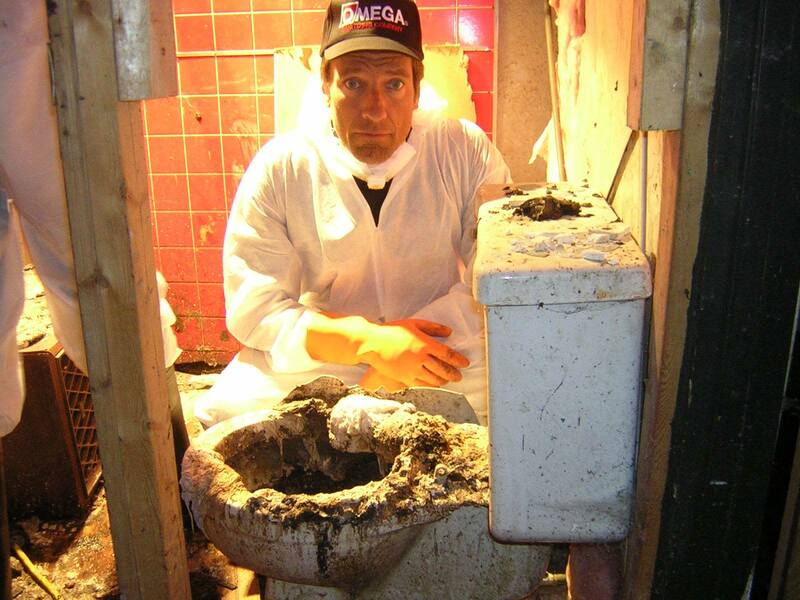 In the meantime, if you’re looking to learn a trade that will always be in demand, check out our scholarship program for plumbers and other tradesmen over here, http://profoundlydisconnected.com/ And if you see Mrs. Frazier out and about, tell her I still expect a courtesy flush. PS. If you’re desperate to see more episodes of Somebody’s Gotta Do It, (and really, who isn’t,) I just found out they’re now available on CNNgo. Now, go enjoy your next meal.